Food rescue charity OzHarvest is running an education program for people on low incomes to learn about cooking healthy food on a budget. At Adelaide’s Hackham West Community Centre a group of 15 people peel carrots, chop onions and boil water for pasta. The air is filled with the smell of frying garlic and onions. There’s laughter and chatter as people pass bowls and knives back and forth. This weekly class aims to teach locals how to choose and cook healthier food on a budget. Each session covers a different theme, which Amanda adapts to suit the needs of the group she’s working with. Topics include balancing your diet; eating food for long-lasting energy; the truth about fats, oils and sugars; budgeting; healthy eating for young children and parents as well as reading food labels, planning, storing and strategies to reduce waste. The nutrition education is low key and combined with hands- on practice. ‘We have a chat and a cook. Everyone in the group cooks in every session. It’s very informal and relaxed. Then we sit down and eat what we’ve cooked together.’In the group’s first session, ‘Balancing it out’ Amanda describes the five food groups and together the group talks about ways of making favourite meals healthier. Perth, Adelaide, Gold Coast, Brisbane, Canberra, Melbourne. Across Australia there are 15 trained NEST hosts like Amanda and 150 NEST volunteers. Amanda uses practical exercises that help people understand complex nutritional information in a way that makes sense but also helps them make decisions that are better for their health. ‘To demonstrate the amount of sugar in different drinks people in the group measure out the amount of sugar in a glass of Coke, a glass of sweetened orange juice and a cup of cordial.’ This kind of activity taps into different learning styles, Amanda says. ‘Then we put it into practise by cooking a meal that incorporates what they’ve just talked about.’ In the healthy fats session, the group use avocados to make guacamole, and the session on sugar has them whizzing fresh fruit smoothies and baking muffins. The final session, called ‘Fridge raid’ is a test of the group’s ingenuity. ‘I tell them to bring along something that’s in the back of their cupboards. We pool it all on the table and combining it with OzHarvest food, we come up with ideas for what we can make. We aim for five dishes. CATHIE VINCENT, Community Development Officer based at Hackham West Community Centre says ‘There are always people in the local community keen to learn basic cooking and budgeting skills. And the NEST program was a great way to attract new users to the centre. For most of the group it was their first time attending the centre and most hadn’t met before. Cathie originally trained as a nutritionist herself and her first job in Adelaide was teaching homeless people basic cooking, shopping and budgeting skills so she knows the challenges involved. Cathie says some nutrition training can have a finger-wagging feel about it that’s offputting. Hackham West is the most disadvantaged area in City of Onkaparinga, which is located on the southern fringe of Adelaide. The Centre distributes OzHarvest donated food to people in the community who are struggling on low incomes and OzHarvest provides most of the food for the Centre’s free children’s service. But OzHarvest’s down to earth approach created a great atmosphere for learning. 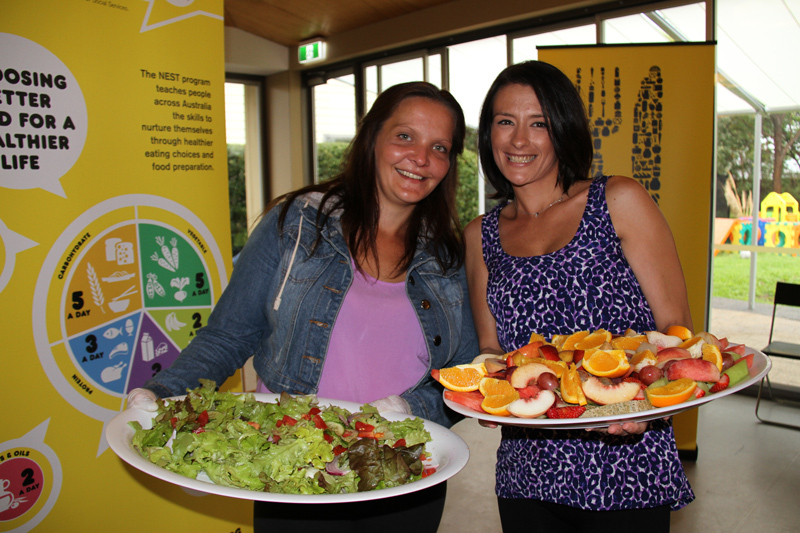 Luckily for Cathie and Hackham West Community Centre OzHarvest are flexible in their approach. When Tim James, Manager of OzHarvest SA came out to discuss running NEST Cathie told him there was one problem. The centre had no kitchen available. The OzHarvest team took it in their stride. The OzHarvest team are good at making do with what they’ve got. And it’s a philosophy they are passing on to participants in this six-week course. What’s the future for NEST at Hackham West? ‘We’d run it again in a heartbeat,’ Cathie says. The centre is hoping to include NEST in next term’s Smart Living program. ‘It’s such a valuable resource, we’re always thinking about ways we can get them back.